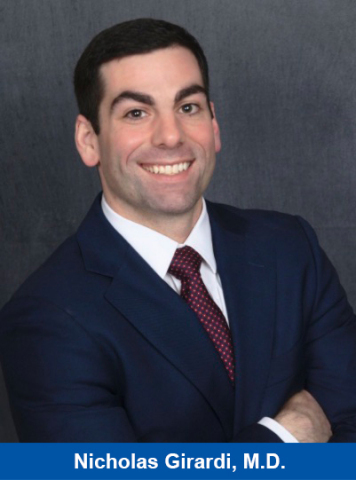 BOCA RATON, Fla.--(BUSINESS WIRE)--Integrated Dermatology, the largest independent dermatology practice in the United States, has added Nicholas Girardi M.D. to its Dermatology & Advances Skin Care practice in Ellicott City, MD. Dr. Girardi will join a successful group of physicians led by medical director and Integrated Dermatology partner, Paul Rusonis, M.D. In this role, he will provide both clinical and cosmetic services to patients. Dr. Girardi graduated from Drexel University College of Medicine in Philadelphia with honors and was elected into the Alpha Omega Alpha medical honor society. He completed his dermatology residency as chief resident at Johns Hopkins School of Medicine and holds a Master of Science degree from Georgetown University School of Medicine in physiology and biophysics. His work has been published in multiple peer-reviewed medical journals and presented at dermatology conferences across the country. In addition to advanced skin cancer treatment and reconstruction, Dr. Girardi has extensive training in cosmetic procedures including Botox®, dermal fillers, cosmetic and laser surgery. “We welcome Dr. Girardi to Integrated Dermatology. His expertise in both dermatological and cosmetic procedures benefit the patients and further enhance the sterling reputation of Dermatology & Advanced Skin Care,” said Jeff Queen, co-CEO of Integrated Dermatology. Integrated Dermatology continues its expansion nationally. Headquartered in Boca Raton, Florida, Integrated Dermatology is the largest independent dermatology practice in the United States. The company acquires and partners with dermatology practices across the United States and has opportunities for dermatologists in all stages of their careers. Integrated Dermatology empowers selling dermatologists to unlock their practices’ value. Dermatologists can choose to grow their practice alongside Integrated Dermatology, while building wealth and enjoying autonomy over the practice of medicine. Some dermatologists may choose to retire after selling their practice or to join as an associate. Other dermatologists choose to join as a partner, rather than an employee, with the infrastructure, support, and resources the company provides. Currently, Integrated Dermatology provides care in 28 states and is rapidly growing.